At Otter Interiors we pride ourselves in supplying and fitting bespoke furniture either to our client’s exact specification or offering a complete design and build service, we are based in Wantage, Oxfordshire and work in and around Wantage, Oxford, Abingdon, Wallingford ad Didcot. 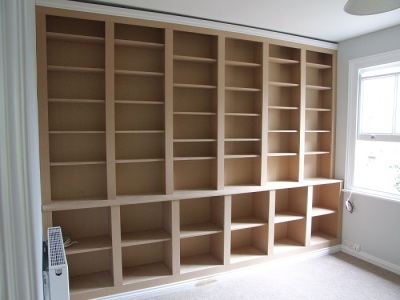 Over the years we have been involved in numerous large projects in London but now tend to specialise in wardrobes, bookcases, cabinets, cupboards and dressers etc. for the home. Bespoke furniture is not as expensive as you would expect, please take a minute or two to browse our projects here and please do not hesitate to contact us. This is a bookcase some 3.6 m wide and 2.6 m high made from 18mm medium density fibreboard (MDF), although MDF has been given a bad press over the last ten years it is ideal for this sort of project, it will not warp or twist and takes a paint decoration very well. The main disadvantage when using MDF is the fine dust it makes when worked, this is one of the reasons we make our furniture in our workshops, disasemble it and reasamble it on site, other advantages of this are that we need less time in our clients house and access is easier with regard to stairs etc. We keep the shelf lengths or bays under 600mm this prevents warping and sagging, all the shelves are adjustable sitting on four brass knibs each. 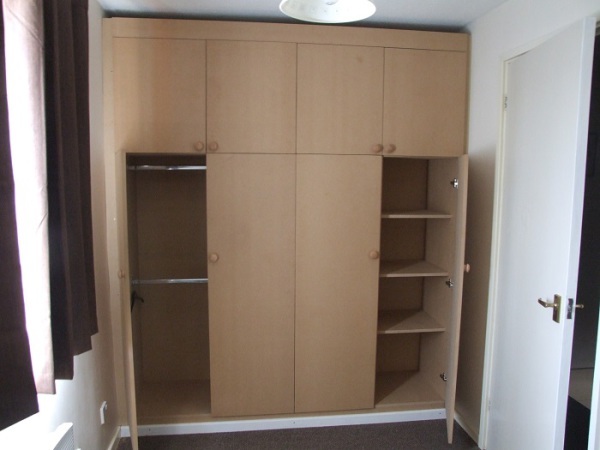 Clients comment "Excellent work, very happy - Paul is punctual, courteous, and makes beautiful furniture"
Again in MDF a wardrobe, 2.8 m wide, 2.3 m highwith four small doors over four full length doors, the left hand side with two hanging rails and the right with six adjustable shelves. Although made to measure this piece is still cheaper than most of the wardrobes available on the High Street.